Flat washer,which is called plain washer, mainly punched out from iron plates. The common shape of a flat washer is a hole in the central. The pore size specifications according to customer requirements. We can produce as customs request. That is customization. It has many standard: DIN125 DIN9021 F436, ect. 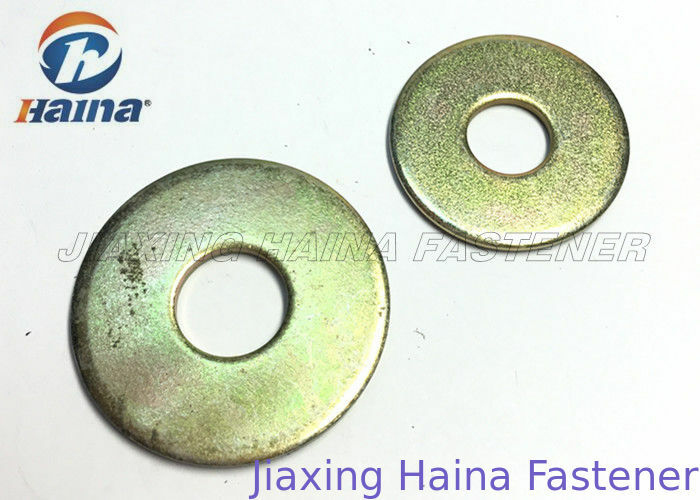 Flat washer is generally used in fitting a soft texture, is a hard and brittle, its role is largely increase the contact area, dispersing pressure, prevent the quality of a material soft crush. Flat mat is: 1, increase the contact area of the screw and machine 2, eliminate the trampoline at the time of discharge screw damage on the surface of the machine.Must be: when using a flat pad, spring pad flat pad close to the surface of the machine, spring cushion between the plain washers and nuts.Flat pad is in order to increase the screw surface.Spring pad to prevent screw loosening, force when a certain amount of buffering effect.Although flat mat can do sacrifice pad.But more often is used as supplement pad or flat mat.And the spring pad a lock.Such as the workpiece hole diameter value (S) and the screw diameter is too large when not using a flat mat or direct use of spring washers, will not only harm the artifacts. Flat washer is generally used to distribute the load of a threaded fastener, such as a bolt, scres or nut. Other uses are as a spacer, spring (wave washer), wear pad, preload indicating device, locking device, and to reduce vibration , rubber washer. Washers usually have an outer diameter (OD) about twice larger than their inner diameter (ID). Our business philosophy consists in “ integrity and pragmatic view, quality first, customer first, continuous improvement” and, as such , our company tends to provide you with products with the best price and high-class quality. We welcome new and existing customers to visit. Material Carbon Steel, or Alloy Steel, or copper, or stainless steel as appointed. Finish Color Zinc Plated, plain finish or as appointed such as Black oxide, Nickel, . Packing Plastic bag & Double wall carton pack (10,000pcs Appr./ Carton, 30kg Appr./Carton). 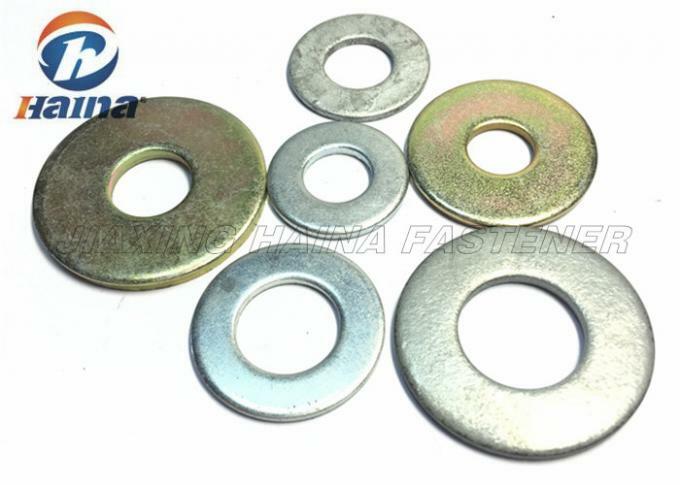 Application Motorcycle / Buliding / Mechanical Machine / Automobile /Home Decorating etc..
Flat Washer is to increase the contact area (bearing), scattered, reducing compressive stress between the nut and fastening pieces, to prevent local due to compression deformation, the function of fastening force is to enhance overall fastening effect.Some load is bigger, also need to be thick flat mat, thick flat pad. 6. Free samples for All kinds of Anchors. 7. We can customized all kinds of fasteners according to cunstomers’ requestment.